Head of Japan's Party of Hope and Tokyo Governor Yuriko Koike speaks at a debate session ahead of October 22 lower house election at the Japan National Press Club in Tokyo, Japan October 8, 2017. TOKYO - Tokyo Governor Yuriko Koike said on Sunday her new party aims to offer voters a “middle of the fairway” choice, seeking to differentiate her group from ruling, conservative Liberal Democratic Party and smaller, left-leaning opposition parties. Koike’s Party of Hope has emerged as a formidable challenge to Prime Minister Shinzo Abe’s Liberal Democratic Party (LDP) at the Oct. 22 election, promising to freeze a planned 2019 sales tax hike and consider a new tax on companies’ retained earnings. “If I use a golf course metaphor, right now, I believe we have right (wing parties) and left (wing parties) and nothing in between. So we will present ourselves as the fairway, the very centre of the way,” Koike told a policy debate by major party leaders. Koike said her party’s policies aim to bring a new idea such as basic income and will be closer to consumers. “The idea of basic income is still experimental but we think this is something we should consider in the future,” she said. But Koike declined to reveal who would lead a government should her party, formed only about two weeks ago by her supporters and some opposition lawmakers, be in a position to form one. “I will think about it after we see the results of the election,” she said. 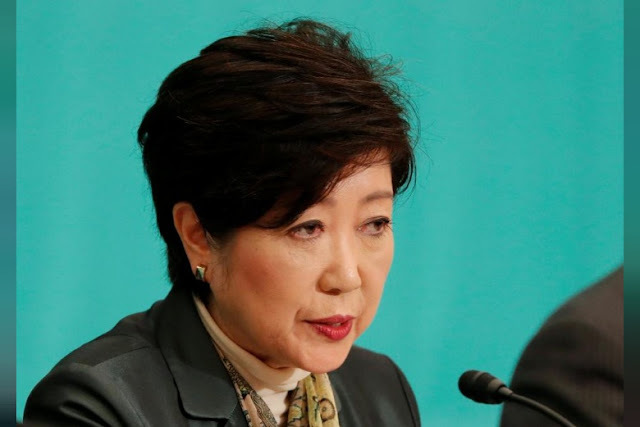 Koike, a former LDP lawmaker, has repeatedly denied she would run for a seat in the election, which means she could not lead a government herself as the constitution stipulates a prime minister has to be selected from elected lawmakers. That has led to speculation her Party of Hope may tie up with some LDP lawmakers who have been alienated by Abe, such as former defence minister Shigeru Ishiba. She told Reuters on Friday that all options were on the table regarding whom her party would back when parliament convenes to vote on a prime minister after the election. While Party of Hope’s economic policies differ from those of Abe’s conservative LDP, but many of its security and diplomatic policies echo LDP’s agenda, including revision to Japan’s pacifist constitution. The campaign for the Oct. 22 election kicks off formally on Oct. 10. The outlook for the election is foggy but some analysts say Koike’s party may be losing steam because it had too little time to prepare for the snap poll. Her decision not to run for a lower house seat could also deter voters, the analysts said. Abe reiterated during the debate that his government would remain in power if the ruling coalition wins a simple majority of the 465 seats up for grabs, although some analysts suggest he himself could face pressure to resign if his LDP fares badly. Tokyo Governor Yuriko Koike said on Sunday her new party aims to offer voters a “middle of the fairway” choice, seeking to differentiate her group from ruling, conservative Liberal Democratic Party and smaller, left-leaning opposition parties.